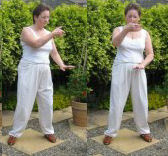 The gentle spine stretches in these qigong exercises will help you enhance the strength and flexibility of your spine. They are not difficult or strenuous - the key is to do them regularly, ideally daily, and to work within your comfort zone. Little and often, slowly and smoothly. Your spine is important - be kind to it. 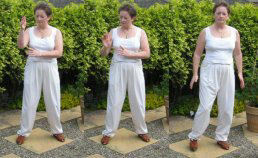 If you like the look these exercises be sure to check out the detailed instructions - there is a link at the bottom of each set of pictures.